WHAT’S SO SPECIAL ABOUT LYNG? The village of Lyng lies on the river Wensum in central Norfolk. It may seem a rather insignificant place just off the A1067 road to Fakenham, but in my opinion it has a very important place in history. You will all have heard of St Edmund, king of East Anglia in the 9th century, and you will know of Bury St Edmunds where the saint was interred some years after his death. It is thought that nobody knows for where he was first buried, and you might think that this Suffolk town of Bury St Edmunds is the most ancient institution connected with this saint, but you would be wrong. That honour belongs (I believe) to the small Norfolk village of Lyng. Let me tell you why. 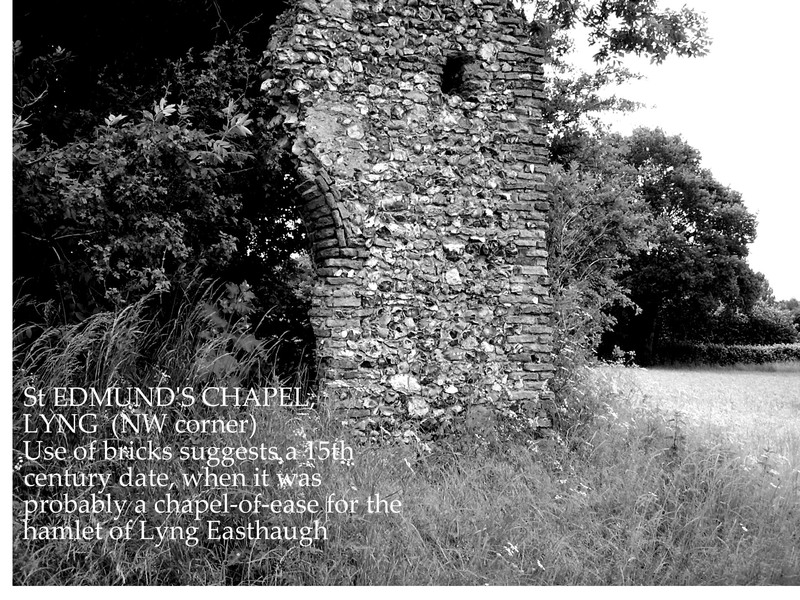 Many years ago this little village had a nunnery and its associated chapel dedicated to St Edmund; the ruins of the chapel still stand in a field near the river, abandoned and unloved. Lyng also possessed a guild dedicated to St Edmund until the Reformation, when nearly many of the guilds in the country were abolished. This was because guilds had a religious setting, although they were essentially a confraternity of merchants in a town or village. The reason for their existence was to restrict business to its members. Another interesting fact concerning St Edmund was the fête at Lyng, which was held at an unseasonal time of year. St Edmund’s Day is the 20th November, and from time immemorial, until the late nineteenth century, Lyng had its annual fair on that day. These things are obviously all connected, but the chapel is most interesting survival. Why was there a chapel here at all? And why was St Edmund regarded as important enough to merit a guild and a fair at Lyng? There are many other places around the county that had religious houses associated with them, but they did not, as far as we are aware, have guilds and fairs dedicated to the saint the abbey was dedicated to. Only Lyng had all these memorials to the name of St Edmund. Whatever can have produced all these connections to St Edmund in Lyng? To answer this conundrum I must outline some of the story concerning the king’s death. This tale was written down by a French monk about a hundred years after the events described took place. In the manuscript the location that was attacked by the invading Danes was a few miles downstream from Lyng at Hellesdon. This event is commemorated on the village sign at Lower Hellesdon, but for some unfathomable reason it is not believed by any academic historians. I think they must live in their ivory towers and have never got their feet muddy in Norfolk. If they had they might know about Lyng too. The monk goes on to say that the king was buried a few miles away from Helledon, and a humble chapel was erected over his tomb. The king’s body did not stay in Norfolk very long, and well before a century had passed his body was re-interred at the place now known as Bury St Edmunds. The king’s body lay in Norfolk for less than 75 years and to this day everyone is unsure where. Everybody except me. Royal Saints and Martyrs were quite common in Anglo-Saxon times, and their earthly remains were always looked after by relgious house; specifically houses of nuns. In Edmund’s case the only guardian of his body we are told of by name was a woman. Her name was Olwen. Even when the Domesday Book was written in 1086, there were many nuns looking after St Edmund at Bury, although by then, under the Normans, monks had been introduced as well. You may have already guessed what I am about to say; that St Edmund was first buried at Lyng. So many facts seem to fit this scenario. It is only a few miles from Hellesdon, where he is said to have lost his life. It is on the same river, and rivers were then the principal form of transport. Against all the odds, the humble chapel still exists, though obviously not in its original form. It is remarkable that anything remains after more than 1000 years, but we are incredibly fortunate that it does -the ruin is just about hanging on. Remember too that it was the chapel of a nunnery, and nuns looked after the martyred kings in Anglo-Saxon times. The Stone that stands near the chapel was called the St Edmund Stone, and King’s Grove would have stood over his body. St Edmund’s Guild and St Edmund’s Fair served to keep his memory alive after his body was removed, but eventually the villagers forgot their connection with East Anglia’s famous king. Only these hints of past glory remained, awaiting rediscovery in the 21st century. I could write at much greater length on the history of Lyng and its connections with the saint; I could tell you of the many miracles that were said to have been done there by Saint Edmund in the middle ages. More will certainly be discovered, if not by me then by others. What might be uncovered by an archeological dig round St Edmund’s chapel? But I have given you enough to think about for now.